We interviewed 48 residents and, in order to identify species, we chose five informants with a more detailed knowledge on local avifauna. We registered 139 common names, distributed into 108 ethnospecies and 33 synonyms, referring to 117 species. Nomenclatural criteria more frequently used were vocalization and coloring patterns. Following Berlin’s principles of ethnobiological classification, three hierarchical levels were registered: life form, generic and specific, with three types of correspondence between Linnaean and folk classification systems. The bird life form (“pássaro” in Portuguese) was associated only to wild species. Studies on biological ethnotaxonomy aim at investigating how living organisms are perceived, identified, named and classified, seeking to understand how people categorize (ethnosemantic domains) and organize (ethnotaxonomic structures) nature elements [1–4]. Some ethnobiological principles of classification and nomenclature aim to identify similarities between cognitive systems in various societies. So, it is important to find out what are the ethnoclassification criteria (morphological, ecological, ethological, etc. ), in order to develop a representative taxonomy of the classification system within a certain community [5, 4, 6–8]. Ethnobiological classification may be a good indicator of the cognitive and behavioral language process . Considering that human beings, on different parts of the world, use similar cognitive strategies to classify living things and organize biological concepts, studies on ethnotaxonomy show, in fact, that the main problem has always been finding what are the similarities or differences that could be really important for classification purposes [10–13]. Among current animal species, birds draw attention due to their gorgeous coloring and shrill songs . Cooker  registered the names attributed by the Chippewa Indians, in northern Mexico, to birds from their region, reporting those they used; this investigation resulted in the first ethno-ornithological study, titled Bird nomenclature of the Chippewa Indians. Regarding the origin of names, the author observed the use of morphological criteria and habitats, and there were also names of species with no meaning. Whereas the scientific nomenclature of birds has been established for over 200years, popular and vernacular designation, as a product of people’s imagination, has no systematization. Vernacular names are popular, vulgar, or common names, which are names adopted by people who live in the regions inhabited by birds . Thus, investigating vernacular names of birds from a certain region provides ornithology with the possibility of registering new occurrences, describing unknown behaviors, locating endangered species, and pointing out conservation alternatives, as well as understanding the relationships between human beings and birds, explaining to society the intrinsic value of cultural diversity . In Brazil, investigations and contributions from local knowledge on birds started when settlers first came to Brazil; they registered bird popular names, as well as stories and legends told by native people, which served, since the beginning, as data on the Brazilian avifauna . Later, many studies were conducted registering popular names and the reproductive ecology of several species ; descriptions of customs, superstitions, and Brazilian and American legends, addressing the etymology of some names . Sick , who is a reference in ornithology, deal with vocalization transcripts, etymology of bird names, and in a very summarized way, legends involving some species. Guided by a theoretical framework of cognitive anthropology, there are the following works: Jensen  examined bird classification systems among four Indian groups having similar environments and lifestyles in the Amazon: Wayampi, Urubu-Ka’apor, Sateré-Mawé, and Apalaí; Giannini  investigated, along with Xicrin Indians, the existence of an Indian ethnoclassification of the avifauna from the Rio Cateté region, in Pará, Brazil; and Carrara  examined the ethnobiological classification of Xavante Indians in Mato Grosso, Brazil. The present article registers the ethnotaxonomy of birds known by residents of the village of Pedra Branca, in the municipality of Santa Teresinha, Bahia, Brazil, cataloguing and identifying popular names, with their etymological description, besides analyzing the ethnoclassification system of local bird species. The biological ethnotaxonomic study is of great importance both for understanding and grasping local biodiversity and investigating the universality of human ability to classify the biological world. The village of Pedra Branca is located in the municipality of Santa Teresinha (12°44’30”S and 39°34’50”W), in the central-west area of Bahia State, Brazil, a region with sub-humid to dry climate features (Figure 1). This municipality has a population of 9,648 people and it is 192 km far from the state capital city, Salvador [22, 23]. Location of the village of Pedra Branca (Santa Teresinha, Bahia) and Serra da Jiboia. Pedra Branca has 406 residents, with 136 families enrolled in the local health care unit and higher concentrations in the age groups from 20 to 39 years and above 60 years. Local agriculture is based on cassava crop (Manihot esculenta Crantz, Euphorbiaceae) and grape crop for producing red wine; livestock is related to cattle breeding. Men sometimes have jobs in civil construction [24, 25, 23]. The village lies at the bottom of a mountainous massive known as Serra da Jiboia, which has around 22,500 ha in area and a maximum altitude of 850 m. Serra da Jiboia is located southern Recôncavo region in Bahia and comprehends the territories of five municipalities: Castro Alves, Elísio Medrado, Santa Teresinha, São Miguel das Matas, and Varzedo [26–28]. Serra da Jiboia is located in an ecotone zone, between the ecosystems of Atlantic Forest and Caatinga, which provides it with a great diversity of climates, reliefs, soils, vegetation, and fauna, being one of the most western sites of the Atlantic Forest in Bahia and one of the wettest forests in the most northern hillside of the state. Its climate ranges from humid tropical, at east and southeast, to sub-humid tropical, at west and northwest . Floristic studies in the area report the occurrence of many plant formations with rock fields on the top, Caatinga at the bottom, and hygrophilous forest at the slopes [29–32]. Regarding avifauna, two studies are known for the region, on distinct areas of Serra da Jiboia, where 221 species were registered by Freitas and Moraes  and 233 species were registered in surveys conducted by the Feira de Santana State University (UEFS) (PhD Caio Graco Machado, person. commun.). The richest region comprises areas where Pedra Branca inhabitants perform some of their daily activities. Field collection was conducted within the period from August 2011 to June 2012 and 48 residents of both sexes were interviewed, 24 men and 24 women, aged from 18 to 87 years. A free and informed consent term (Resolution 196/1996 from the Ministry of Health) has been prepared to explain the objectives of this study; it was distributed to participants, asking if they agreed to provide information, respecting the decision of those who declined to participate in the research. The study was approved by the Research Ethics Committee of UEFS (CAAE 0077.059.000-11). Initially, data were obtained both through open interviews, exploring and detailing the theme under study, and semi-structured interviews based on a list of pre-selected topics. As a final phase of data collection, a projective test was performed consisting on the presentation of visual and auditory resources to encourage interviewees to speak spontaneously about what they saw and heard . These photographs and vocalizations were of species of birds that inhabit both Atlantic Forest and Caatinga environs. The photographs used came from personal files and Wikiaves , while the auditory resources came from Wikiaves’ data bank. Five male informants (ages 31–63), who showed a more detailed knowledge on the local avifauna during the interviews, were chosen for this data collecting technique. They were approached individually and were very skillful on identifying bird species. The term ethnospecies is employed in this study when an ethnobiological taxonomic category corresponds to the Linnaean scientific species, independently of how many popular names it receives. The scientific nomenclature followed the Comitê Brasileiro de Registros Ornitológicos . The endangered status followed the Lista Vermelha das Espécies Ameaçadas do Ministério do Meio Ambiente , the International Union of Conservation of Nature , and the Birdlife International . Data were analyzed using the union model. According to this model, all available information on the surveyed subject is to be considered . For checking their reliability, interviews were conducted both in synchronous situations, with the same question being asked to different individuals in a short interval of time, and diachronic situations, when the same question was asked to the same individual in a long time interval . All ethnographic materials (recordings, transcripts, photographs, and drawings) are kept at the Laboratory of Ethnobiology and Ethnoecology of the Universidade Estadual de Feira de Santana (UEFS), state of Bahia, for evidential purposes. This study adopted the hierarchy structure proposed by Berlin , whose decreasing inclusion taxonomic classes form the following levels: kingdom, life form, intermediate, generic, specific, and variety. We used Venn’s diagram [42, 43] for relating the ethnobiological taxonomy to the Linnaean taxonomy,, where there is indication of Linnaean and ethnobiological taxa by means of circles with different marks, and it also enables showing the closeness between folk members . For comparing the popular taxonomy to the Linnaean taxonomy, we used correspondence categories in evaluations regarding the popular generic names and scientific species, such as 1:1 correspondence, where the popular generic name refers to a single scientific species; over-differentiation, when two or more generic taxa refer to a scientific species; and under-differentiation may have two types, type 1 occurs when a single generic name refers to two or more species from the same scientific genus and type 2 occurs when a single generic name refers to two or more species from different scientific genera . The interviewed cited 139 common names of wild birds, which refer to 117 Linnaean species (Table 1). Unlike the Berlinean system , when the author says that the name structure of specific taxa in the ethnobiological classification systems is regularly binomial, out of the total number of common names in this study, 63 have binomial names and 77 have monomial names. See Table 2 to check out the glossary of all local bird names. Common names follow the local language. (*) refers to English common names as cited in the scientific literature; (**) refers to those English common names freely translated by the authors. Most of the bird species were given a single name (even when it is a compound name such as beija-flor = hummingbird), although they represent one or more Linnaean species. In other cases, some species are popularly known with different popular names but they correspond to just one Linnaean species. Considering the relationship between generic taxa and scientific species, we registered the occurrence of three types of correspondence between the biological and popular classification systems proposed by Berlin et al. . For instance, out of the three types of beija-flor, only one receives a specification, i.e. beija-flor-rabo-de-tesoura (Eupetomena macroura), due to the morphology of its tail. This type is named one-to-one correspondence. The other two species (Phaethornis pretrei and Florisuga fusca) are named only beija-flor, with an under-differentiation of type 2. The same happens with the popular name garça, which represents two scientific species (Ardea alba and Bubulcus ibis). We observed the occurrence of an over-differentiation for the specific names coruja-amanhã-eu-vou and coruja-bacurau, identified by means of vocalization, referring to a single species Hydropsalis albicollis. The first specific refers to a common singing in this species and is possibly related with the reproductive behavior, while the second one, coruja-bacurau, refers to its calling . Common name formation in this study follows different criteria, such as morphology (coloring pattern, body shape and size), behavior (vocalization, reproduction, and feeding), habitat, and anthropogenic features (Table 3). However, vocalization and coloring pattern in birds were the criteria used more frequently by respondents and, according to Berlin , morphology is one of the main criteria used to designate ethnospecies, as well as to differentiate them. Anu-branco, anu-preto, azulão, beija-flor-verde, gavião-pedrez, jacu-gogó-vermelho, nambu-pé-roxo, nambu-pé-vermelho, pássaro-preto, rolinha-branca, rolinha-caldo-de-feijão, sabiá-bico-de-osso, sabiá-branca, sangue-de-boi, urubu-preto, urubu-cabeça-vermelha. Beija-flor-rabo-de-tesoura, bem-te-vi-coroão, bigode, coleiro, codorna-pimpão, caburé-de-orelha, corujão-de-orelha, coruja-rabo-de-tesoura, charuteira. Assanhaço-coqueiro, caburé-de-estaca, caburé-de-murundu, canário-da-capoura, canário-da-terra, canário-belga, espanta-boiada, pato-d’água. Acauã, bacurau, bem-te-vi, cancan, cavala, coruja-amanhã-eu-vou, coruja-bacurau, gué-gué, chorão, guriatá-vivi, jesus-meu-deus, maria-do-dia, peixe-frito, sede-sede, rolinha-fogo-apagou, saiacaia, socó-boi, tiotoin, trinca-ferro, tiziu, três-potes. Beija-flor, chupa-laranja, papa-laranja, gavião-carrapateiro, gavião-pega-pinto, gavião-peneira, martim-pescador, mergulhão, papa-capim, pica-pau, sabiá-lasca-carne, sangue-de-boi, urubu-rei,. Usually, species with rather peculiar morphological similarities are not differentiated and they are given the same name [45, 46], as in the cases of corujão (Pulsatrix koeniswaldiana; Strix virgata), garça (Ardea alba; Bubulcus ibis), and gavião-rapina (Geranoaetus albicaudatus; Buteo brachyurus). Moreover, feather coloring patterns are morphological features also used by residents to differentiate females from males, and the latter, usually, have feathers with brighter colors, due to sexual selection, that is, the female will choose the male because of its physical features . Vocalization is an important aspect for identifying bird species, that is, the sound emitted by them often becomes their popular name on a local basis. Thus, there is an onomatopoeic name formation [44, 4, 48, 49, 16, 50, 51]. Among behavioral criteria, also stands out name formation through trophic ecology, such as in the case of specific names: gavião-carrapateiro (Milvago chimachima), which feeds on ticks at cattle and horses; gavião-pega-pinto (Rupornis magnirostris), which feeds on chicks of other birds, among them the domestic ones, regarded as easy prey; and gavião-peneirador (Elanus leucurus), which has the habit of hovering against the wind to see its prey [14, 52]. Other studies also pointed out hawk grouping as related to feeding behavior [53, 45]. The ethnospecies urubu-rei (Sarcoramphus papa) was the only one related to the generic name urubu (urubu-cabeça-vermelha e o urubu-preto), which was named due to its feeding behavior, as the existence of a hierarchy between these species has been reported, where other species feed only after urubu-rei . Regarding names related to reproductive behavior, 3 ethnospecies were related to nest formation: cava-chão (Nystalus maculatus), which digs holes in slopes; carrega-madeira (Phacellodomus rufifrons), which piles wood fragments; and joão-de-barro (Furnarius rufus), which uses mud [14, 54]. Fluvicola negenta has its nomenclatural formation based on the anthropogenic aspect. Culturally, this ethnospecies is related to religious belief, something which defines its importance within the community [16, 55], as reported in the following excerpt: “People have to say they gave the name ‘lavandeira’ because it helped Our Lady to wash clothes” (Mrs. M, 63 years). There are species designated on a local basis, however, they may be given another name, such as in the case of Vanellus chilensis, which in Pedra Branca is named espanta-boiada, but it is also known as quero-quero: “Each region gives its name. Here it is named ‘espanta-boiada’. It is also observed in the football field. There, it is called ‘quero-quero’ ” (Mr. E, 48 years). Stauber et al. emphasize the importance of studies and records of regional and local variations in the popular nomenclature used, before this is overcome by the academic nomenclature and even by the media. 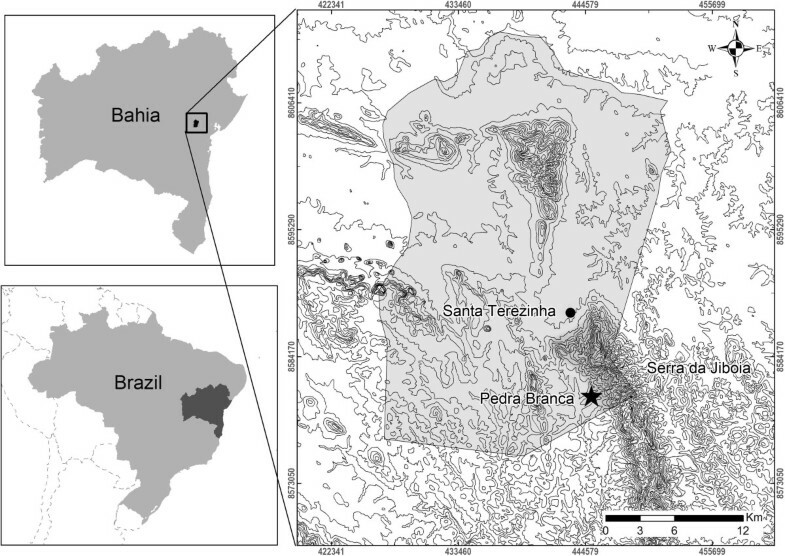 In what concerns the field of ornithology, this study corroborates the importance of researching on local names , as a new distribution in the occurrence of Strix virgata has been recorded for the state of Bahia, namely at the Serra da Jiboia. This species has few records in Bahia and in accordance with literature its distribution was just known to the south of this northeastern state [57, 14, 58, 59]. The latest photographic records are documented in the site Wikiaves [60–62]. In the present study this record just happened because this bird gets the popular name corujão, which also refers to two academic species, Pulsatrix koeniswaldiana and Tyto alba, and taking into account the morphological resemblance to the first one, Strix virgata was only identified through the collection of a specimen by means of some informers’ reports about its position inside the woods. Similar situation was experienced by Sick et al. in the Raso da Catarina (Bahia) when they reported that the participation of local informants was decisive for the record Anodhorhyncus leari. For starting the identification of ethnospecies by informants, we defined two lexemes: ave and pássaro (=passarinho). According to local perception, presence of feathers, presence of wings, being able to fly, as well as body size and breeding for slaughter, were relevant features for this differentiation. The term ave mainly refers to species bred at home, such as galinha (Gallus gallus), pato (Cairina moschata), and sacué (Numida meleagris). In turn, pássaro or passarinho are terms used to designate species that are not domesticated, even those bred in captivity. A testimony exemplifies this semantic distinction: “‘Ave’ is bred at home and ‘pássaro’ always lives in another place. ‘Galinha’, ‘peru’ are called ‘aves’ and the animals we see flying out there are called ‘pássaros’” (Mr. R, 69 years). The presence of feathers leads some informants to include the term pássaro into ave, but it is differentiated due to the species habitat, either on trees or on the ground: “All feathered ‘pássaros’ are called ‘ave’, you know. All of them are this kind of ‘ave’. The difference is subtle, because the difference of ‘galinha’ is that it lives on the ground, and ‘passarinho’ does not, it lives over there, it flies, it also sits on the floor, but ‘galinha’ lives on the ground. ‘Passarinhos’ build their nests on trees and ‘galinhas’ on the floor” (Mr. J, 48 years). Other studies have also reported these categories, and the ethnospecies galinha, peru, and periquito are included as “bred at home” or “bird on the ground”, as gavião, garça, and pássaro-preto are “wild bird”, “self-bred bird”, or “flying bird”, and these categories include species that are called pássaros or passarinhos, due to captive breeding [64–66]. For some communities, this category of aves covers animals that fly, present a beak, feathers, and lay eggs [19, 16]. Brown  introduces ave as large animals, which have wings, feathers, and a beak (always including pássaros), whereas the bird life form includes flying mammals, such as morcegos, a fact also found out by Jensen  and Blumer . This inclusion is registered in Pedra Branca, as observed in the following interview excerpt: “I think ‘morcego’ is regarded as ‘passarinho’, it has wings and flies” (Mr. F, 31 years). Ethnotaxonomic information of respondents seemingly allows us to order them hierarchically, according to the principles of categorization proposed by Berlin , where three hierarchical levels were recognized: life form, generic, and specific. In this study, the lexemes pássaro and passarinho match the ethnotaxonomic level “life form”. These lexemes include all wild birds cited in the study, but they do not correspond to the Linnaean taxonomy, because pássaros are animals belonging only to the Passeriformes order [69, 70]. The recognition and grouping of the generic name sabiá in the region, for instance, mainly relies on morphology, and the vocalization and trophic criteria are responsible for identifying and defining the specific names (Figure 2). Even though sounds are similar, we can identify species in the field [14, 53]. 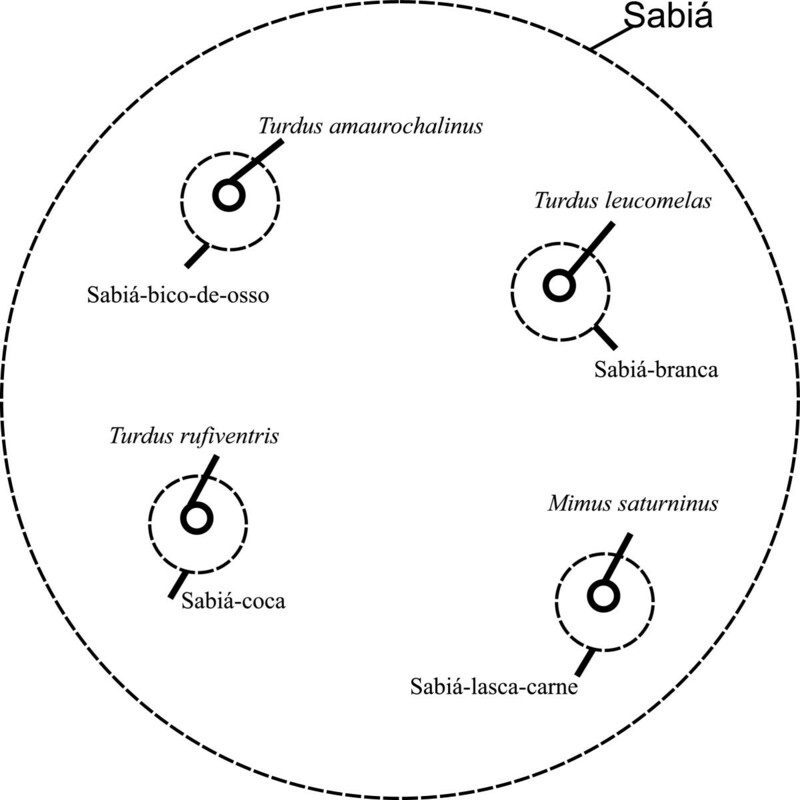 Grouping the specific names sabiá-bico-de-osso, sabiá-branca, and sabiá-coca corresponds to the Turdidae family in the Linnaean taxonomy, while the specific name sabiá-lasca-carne belongs to the Linnaean Mimidae family. The correspondences found were 1:1 for the 4 specific names cited. Specific folk generic “sabiá” and its equivalents in academic taxonomy. According to respondents’ perception, acauã (Herpetotheres cachinnans) is recognized as a kind of gavião, but it is not included in this generic name, constituting a monotypic generic name. 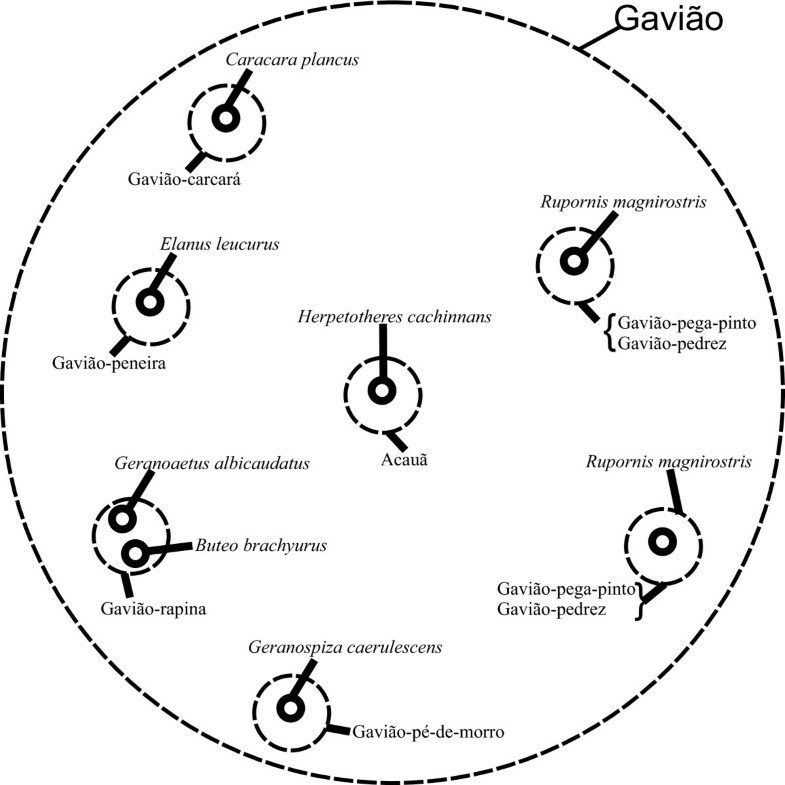 The generic name gavião has eight specific names and the morphological and behavioral criteria are used to group this set of birds (Figure 3). The specific names gavião-carcará (Caracara plancus), gavião-carrapateiro (synonym gavião-carcará-menor, Milvago chimachima), and acauã (H. cachinnans) correspond to the Falconidae family, and the other ones belong to the Accipitridae family. In this example, 4 1:1 correspondences, 2 under-differentiations, and 1 type B over-differentiations are found. Specific folk generic “gavião” and its equivalents in academic taxonomy. The information registered here shows a broad ethno-ornithological knowledge within the community living in the village of Pedra Branca, so that many birds are given names followed by synonyms, while others have only a single name and there is a correspondence between the folk ethnotaxonomy and Linnaean taxonomy. The results reinforce the need of the participation of local informants in inventories of birds in order to record potential new distributions in the occurrence of species, mainly those nocturnal and even migratory birds. Through the analysis of popular names, it was possible to identify the nomenclatural criteria used to designate the birds; vocalization and coloring pattern were those more frequently used. Virtually all respondents reported the same etymology for the common names of ethnospecies, something which means that local names are strongly conveyed within the community. Feeding behavior was a relevant aspect in this research, because besides forming names, it also allowed identifying and hierarchically ordering species. However, the formation of some names did not follow any criteria, as some ethnospecies were identified due to some kind of behavior, vocalization, and habitat. According to the Berlinean classification model, there was a hierarchy into three levels: life form, generic, and specific. Even meeting two lexemes ave and pássaro (passarinho), we opted to use pássaro at the life form level, listing only the wild birds. The authors thank the community in Pedra Branca, especially the informants, for their information and availability to participate in this study. The biologist Osmar Borges for considerations on the species Strix virgata. The laboratories of Ethnobiology, Ethnoecology, and Ornithology of Feira de Santana State University (UEFS), for their structural and logistical support. The Coordination for the Improvement of Higher Education Personnel (CAPES), for the scholarship granted to the first author. Rafael Almeida for the english review. This article was part of the dissertation entitled “Ethno-ornithology in the village of Pedra Branca, Santa Teresinha, Bahia, Brazil”, pursued at UEFS’ Graduate Program in Zoology. ATGL carried out the field research and drafted the manuscript. EMCN, CGM, and FMF participated in its design and coordination, and helped to draft the manuscript. All authors read and approved the final manuscript.